Hit the Trail with The Pink Link and Kirkwood Hospice! Kirkwood Hospice’s Trail Run for 2017 is fast approaching! Kirkwood Hospice is set to hold its annual Trail Run event for 2017, taking place on Sunday 3rd September at Leeds Road Playing Fields, Huddersfield. The smooth course and beautiful surroundings at the Leeds Road Playing Fields make it the perfect home for the annual Kirkwood Hospice Trail Run. Now in its sixth year, this scenic 5k or 10k course is the perfect sporting event for the whole family to enjoy. Whether looking to beat that personal best or take on a first ever sponsored charity run, the 2017 Trail Run is a fantastic opportunity for participants of all ages to test their abilities against fellow supporters in the Hospice’s 30th Anniversary year. As the family-fun event fast approaches, Trail Run sponsors made a special visit to the Hospice to kick-start promotions. 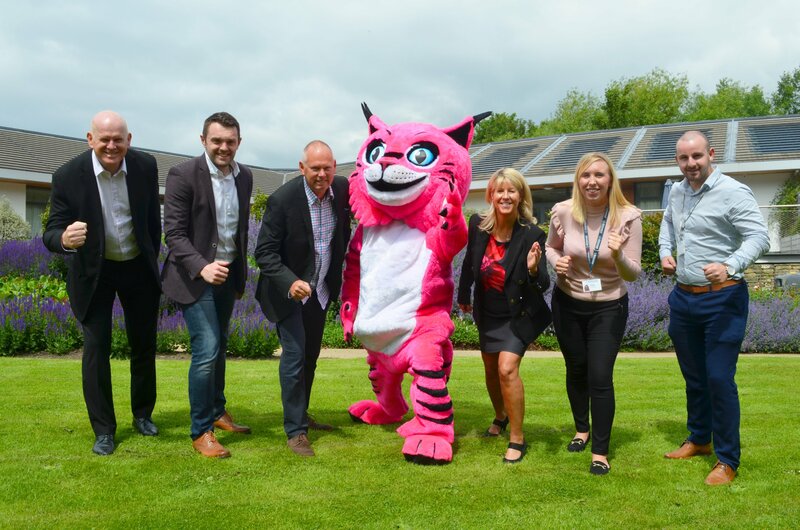 Loyal Supporters from the Woodman Inn, Graham and Craig Leslie and General Manager, Chris McHugh, along with Managing Director at The Pink Link, Vicki Davenport, are backing the event for the sixth year running with their generous donations. Join fellow runners around the 10k route or join Vicki Davenport, Managing Director, who will be taking part in the 5k race. Kirklees Active Leisure, who are donating the use of their site, Leeds Road Playing Fields, for the event are planning goody bags to be given out at completion of the race as well as promoting the event at all 13 KAL sites throughout Kirklees. A keen runner himself and member of the Holmfirth Harriers since 1980, Kirkwood Hospice Trustee, John Philpott, founded the event six years ago in memory of his wife, Joanne Philpott, who sadly died at home in 2010, aged 50, surrounded by her family and the support of the Hospice. John, his four children, and friends of Joanne, Vicki, Graham and Craig, wanted a lasting way to remember Joanne and decided upon a race on the anniversary of her death, soon becoming the 5 and 10k Trail Run! John said: “All my family and friends think of the race as Joanne’s race and they all get involved. Joanne was a Practice Nurse at Church Lane Brighouse and they have a team taking part this year too. “I think about Joanne so much. I think of her on the anniversary of her death, and at the race, which motivates me enormously.